It's a website called tinyDallas, celebrating (but not limited to) all things "kiddo" in our fair city. It seems like Christine and I have been talking about doing something like this for ages, as we were frustrated that there was no great online resource for sleuthing out cool things to do, see, eat, experience... in Dallas. We knew firsthand that the city was full of hidden gems, but it seemed you always had to magically stumble upon them or learn about them through word of mouth. Let's face it, Dallas gets a bad rap for all sorts of imagined (but sometimes real) reasons, so while tinyDallas is targeted at local folks with kids, we also want it to be something that can act as a sort of online ambassador, sharing the Dallas that we know and love with the rest of the world (so all you non-Dallasites please read it too). We also wanted to create a place where we could celebrate being the types of parents we're all striving to be -- balanced, focused, adventuresome...a place where we acknowledge that life with kiddos doesn't have to mean we check our interests at the door but instead we share them with our offspring in hopes that we'll inspire them to grown into well-rounded, fulfilled adults. So take a peek and feel free to share any ideas about what you guys would love to see over there! Wow! I am super inspired by this new project! 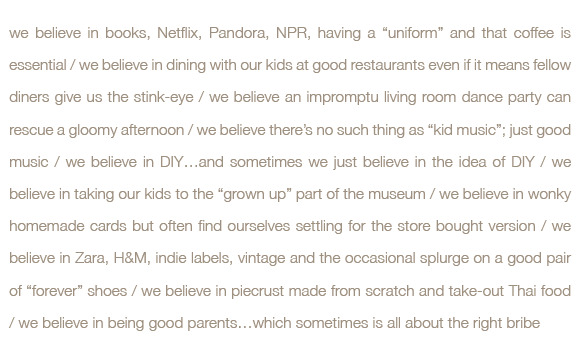 I have been reading your blog for awhile now and always felt that you did the raddest things with your kids. 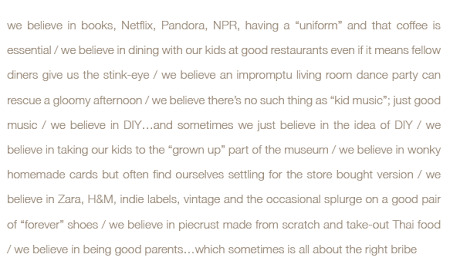 I LOVE the manifesto, and though I don't have kiddos of my own yet, will definitely aspire to be that kind of mom. Thanks for the inspiration and bravo on Little Dallas! Congrats Joslyn, I love it. You're making me want to become a mom. Love! Congrats! Dallas gets a much worse rap than it deserves - I look forward to the exposure of many of your fabulous "hidden gems" at Tiny Dallas. Kudos! You have no idea how excited I am about this site! We are moving to Dallas in just a few weeks so something like this is perfect. Thank you! This looks amazing! Just in time for our family move to Dallas. Looking forward to reading more. the best manifesto i have read in a long long time. bravo on this new adventure. FINALLY! I love Dallas and can't wait to see what y'all showcase. Such a great idea. I have family in that area and will have to send along a link for them! THANK YOU! my google searches for fun, creative things to do with my toddler in the city which i love, have driven me to drink! there are a lot of us out here who will use this site faithfully. congrats! it looks great, can't wait to look around. Such a great idea! I live in Austin and have been reading your blog for a few months now (and love it, btw). Can't wait to follow your this new one and share it with my Dallas mom girlfriends! great minds---as they say...this kind of thing has been on my mind for several years after moving back to Dallas from NYC with my then 18 month old, 4+ years ago, wondering what in the world there was to do with a kid here. SO GLAD you're doing this! What a great idea! Our city could use one of these sites, too. what a great idea. congrats on your new project, J! Looks great! Awesome! How exciting! I just looked around for a bit and love it...can't wait for more! We're proud DFW'ers. Congratulations - it looks great, and I love the manifesto!